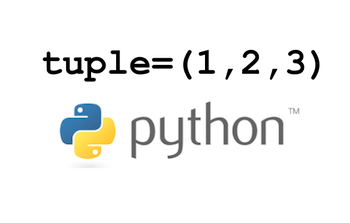 Tuple is similar to List in python language, both are sequential, index based data structure. The main difference between tuples and list is that tuples are immutable i.e. we cannot modify a tuple’s content but List is mutable data structure. Also, tuples uses parenthesis and list uses square brackets. Tuple can be created by simply writing elements of tuple, separated by comma “,” enclosed by parenthesis. Parenthesis is optional, but it is good practice to enclose the elements with it. The following creates an empty tuple. Empty tuple can be useful in few algorithmic codes where empty structure is required in some cases. The following tuple has all integer values for it’s elements. The following tuple has all string values for it’s elements. The following tuple has a combination of both integers and strings for it’s elements. You can also create a tuple just with one element. But, make sure you use a comma as shown below. Without comma, you are not creating a single element tuple. Note: Without extra comma, t1 will be integer variable instead of tuple. So to create a tuple with single element always use comma after the element. It will throw an error whenever code try to modify its elements. As already discussed Tuples are immutable so we cannot modify elements of a tuple, and addition of elements not supported, so append, add functions are not defined for tuple. You can loop through items in a tuple using for loop as shown below. You can add (concatenate) to tuples using plus (+) as shown below. Use len function as shown below to identify the number of elements in a tuple. ‘:” can be used to get slice of a tuple, slice will start from first index and before the last index. And if one index is absent then all the items till that index. # The following line will give an error message.